The Shamanistic Mysticism of Catal Huyuk 5800 B.C. Paintings have been recovered on the walls of what are described as shrines from Neolithic sites in Turkey. 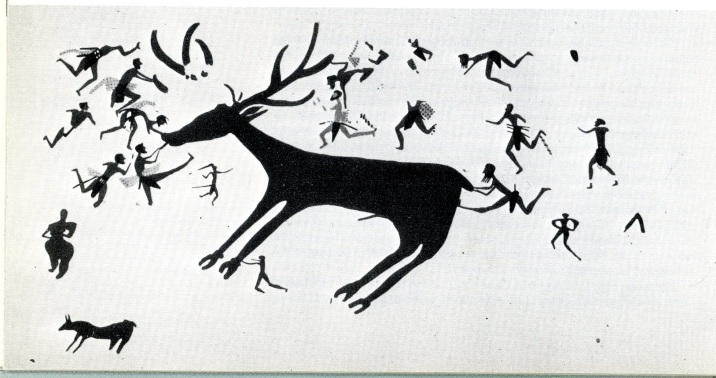 These images, shown below, depict animals being set upon by what appear to be hunters. But are these simply depictions of hunts? 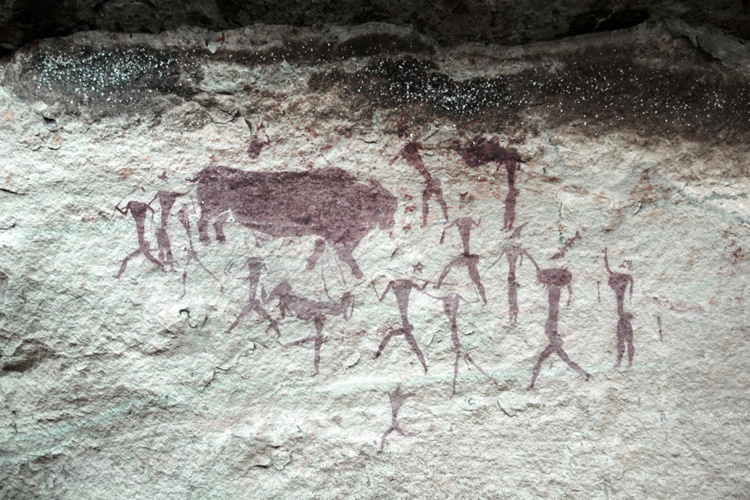 Images from South Africa created by a paleolithic people, the San, have a similar composition, and it is known what they depict (see below). 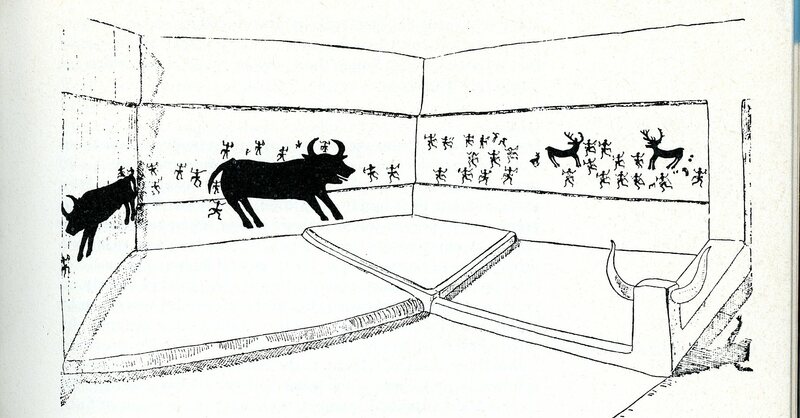 The hunts depicted in San rock-art do not take place in the earthly realm, but in the spiritual world. The San create these pictures to manifest the power of shamanistic vision quests created in altered states of mind, achieved by way of rhythmic dancing (other methods are used by different societies to achieve similar mind states, including drugs, meditation, and physical stress). In these mystic states souls can interact with the spirit creatures that the San believe exist in the rock and control nature. The animals are called rain animals because they are said to bring rain. The capture of the rain animal by the shaman allows them to bring its rain into the material world. Clouds are themselves described as a beast, with the columns of rain its feet. The spirit animals, like earthly animals, give nourishment. Just as this nourishment is not obtained in the normal way humans obtain nourishment from animals, their existence is not apparent like earthly animals. Instead they provide nourishment in a magical way and can only be directly observed by shifting one’s consciousness into the magical world of spirit beings. 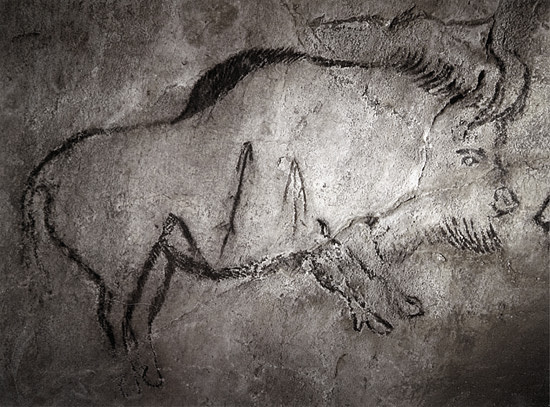 This concept has also been applied to similar images found in the caves of Ice Age Europe (see below). 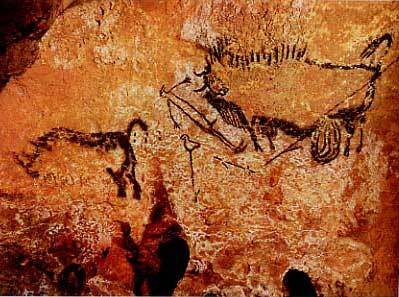 The Cro-Magnon peoples did not use human forms nearly as much as the San, but the images of Shamans stalking bison, and the depictions of such animals being assaulted by spears may carry the same function- to show the shaman leading animals out of the spirit world through the womb of the earth goddess and into the material world. That paleolithic Europeans believed a spirit woman birthed animals is an interpretation supported by the commonness of this theme around the world and the frequent occurrence of female figurines among the Cro-Magnon. In fact their closest relatives today, the Basque, have retained myths of the mother goddess living in caves and birthing the gods from there. Note in the lower left corner of the image from Turkey the figure of the mother goddess is very similar to the styles used for thousands of years in Europe. The paintings in Turkey may be evidence of the retention of the ice age religious practices by the first towns, with the walls of the shrines becoming an artificial cave or rock wall. The walls at Catal Huyuk could be concretized shamanistic journeys where the spirit animals birthed by the goddess could be captured by shamans. The rituals may have included part of the general community in order to help enact the spirit hunt. Or perhaps only select elite interacted with the images. Either way, the animals may not be representing simply animals but spirits that control the beast, or given the agricultural focus of these sites, the weather. It should be kept in mind the association of sky gods with bulls throughout the ancient near east and Greece. The close resemblence between the pictures at Catal Huyuk seem to indicate that not only did the priests there owe their traditions to people who sought shamanistic visions though altered mindstates, but likely that they still did. Lewis-Williams, J. David. The Mind in the Cave. London: Thames & Hudson, 2004.